A new clock MagicSlider has appeared for sale in the Magic Kingdom at Big Top Souvenirs, The Dark Room at Hollywood Studios, and other locations throughout Walt Disney World. 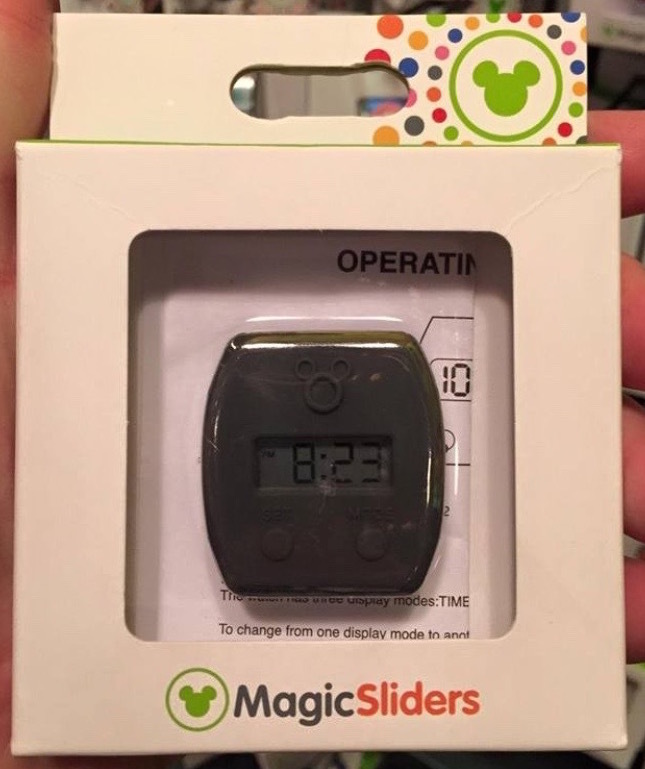 This will slide onto your MagicBand and add the functionality of a watch, which has been a highly requested feature guests have been asking for. The price is $17.95. This clock cannot go over the Mickey head on the MagicBand and must be on the side of your band, so it may make it feel a bit bulky. It’s a bit big for my liking and I don’t like the color and design, but it’s better than nothing. Most people carry a mobile phone, so this is for people who don’t want to lug that around, and it’s especially helpful for kids and teens who need to meet back up with parents who don’t own phones (e.g. “meet me back here at 3:30”). Update: Disney has announced the new slider, along with an analog Minnie Mouse one as well. The clocks are water resistant, but not waterproof. Special thanks to Matthew and Brandi, a reader of this site, who sent me the information and pictures about this item. 16 Responses to "You MagicBand can now act as a watch with these new MagicSliders"
Good idea, not a fan of the execution. I’ve always felt like they should team up with FitBit and make a higher end Magic Band with FitBit features like fitness tracking and a clock, or reminders of Fast Passes coming up, etc. Just quick to point out that while that is a good idea, you are probably looking at over $100 for the combined functionality. Aside from the most basic FitBits/Garmins(etc. 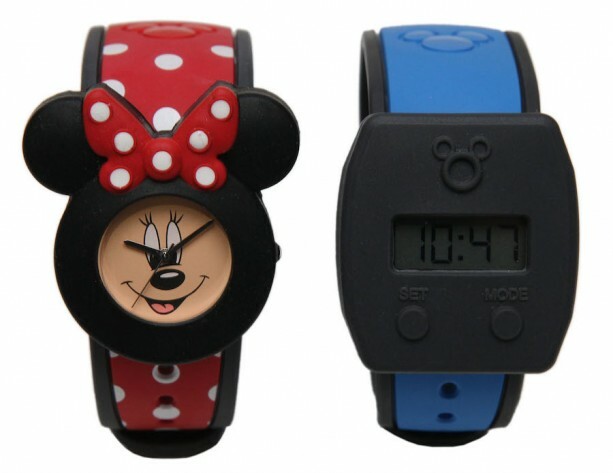 ), most have a watch function built in and the smaller models could easily go right beside a MagicBand. I have a Garmin VivoSmart fitness band, and now I need to check and see if it is waterproof. looks waterproof..any confirmation that this will be ok for the water parks? I’m going to try and pick one up tomorrow and let you know. is it waterproof? i would like to purchase it. Yep, I saw it, I will update the post in a minute. Thanks! Can you design a Camo/realtree/mossy oak style magic bans? ? Just received my adorable Minnie Mouse watch slider. Cannot figure how to get it to start. Is there a hidden battery compartment? I actually don’t know! I will need to grab mine and take a look. Are the batteries easy to change? I just bought the digital one and I’m hoping it will be easy to change. Etsy actually has a piece that puts the magicband puck on your current watch’s band….